There is a saying that a picture is worth a thousand words. Might I so boldly add that a picture is also worth a thousand opinions that are based, for all intents and purposes, entirely on ignorance? During my research for this article I encountered various opinions about the Automated Safety Hitch System across the broad spectrum of RV forums. One wonders how a product can be sold when so many uneducated opinions are shared about a product that they know nothing about. Why do people do this? Is it fear? Is it the unknown? Is it the desire to feel smart? Well, I’m not a psychiatrist and I will not venture to answer these questions. While I was in Odessa, TX, a client E-mailed me and asked for my opinion on the Automated Safety Hitch System. I’d never heard of it and after reviewing the hitch system website, I decided to take a detour from my planned route and head to Denton, TX, where the manufacturing plant is located. Denton is located about 30 miles north of the Dallas/Fort Worth metro area. During the course of two meetings, I met and received a warm welcome from Joe Jamieson who is the CEO of Automated Safety Hitch, Inc. and the inventor of the Automated Safety Hitch System. One commented on an RV forum, “I do not like the looks of that thing”. It does have an unusual appearance at first glance. But after studying it and understanding how it operates, it grows on you. It doesn’t take long to realize the Automated Safety Hitch System is one of the most innovative RV safety products on the market. Jamieson states that braking is improved by as much as 50% and, as I test drove it, I believe it. During my test drive I towed a good size, two axle horse trailer and I could easily stop just by activating the brake controller only. Very little pressure is required to brake with the truck’s brake pedal. Turning around corners and maneuvering through traffic is a breeze with the steerable axle that locks straight automatically when not doing slow tight turns. It’s fascinating to watch as the trailer appears to swing to the outside while turning a tight corner. In reality, the trailer continues to follow the path of the truck and begins to turn at the pivot point of where the truck’s rear axle pivoted. The horse trailer tires cleared the island by 3 feet as I was navigating through a tight left turn. The maximum hitch weight is rated for 6,300 pounds but can be upgraded to 8,000 pounds. The steerable axle is a Dana 70 series and is equivalent to those used on one ton and one and one-half ton trucks. The axle is equipped with heavy duty hydraulic disk brakes having vented rotors and is powered by the on-board hydraulic system. The unit also includes a battery and electrical system to power the on-board equipment. Jamieson told me about one of his customers who shared the scary moment when his truck engine suddenly shut down while towing down the highway, therefore, almost losing the truck brakes and the steering becoming difficult. Fortunately, the owner had a cool head and reached down to the trailer’s break controller and performed a well-controlled and safe stop. For RVers who are contemplating upgrading from a three-quarter ton vehicle to a one ton truck, they may not have to. I, for one, wish I had known about this hitch system before I traded in my new Ram 2500 for a new 3500 dually over three years ago. The Automated Safety Hitch System certainly has the potential to save some money considering one may not have to upgrade. For example, in my own personal case, not only did I trade in my 2500, I ended up throwing in my fairly new Toyota Tacoma valued at $15,700. Depending on options and customizations, the Automated Safety Hitch System could range in price from $10,000 to $11,000. That may seem like a hefty price tag, but when considering the unprecedented safety features this hitch system provides, as well as other cost saving features, the price is less of an issue. Included with each unit sold is a notarized letter indicating the regulatory compliance in 9 continents and regions stating that the Automated Safety Hitch System is classified as a lift/drop axle, not as a trailer. Therefore, registration with state and county motor vehicle departments is not required. The letter also states that the additional seven to nine feet should not be added because “the length of devices determined to be necessary for safe and efficient operation should be excluded.” Several states have laws that exempt the lift/drop axle from the length limitation. Jamieson said that none of his customers have reported being ticketed for length violations. I’ve towed in many states that have a maximum trailer length limit of 40 feet; I’ve never yet been stopped by law enforcement holding a tape measure. There are additional links below covering state RV length laws. If unsure, contact your local state agency. As I was about to depart our second meeting, I commented to Jamieson that the Automated Safety Hitch System could revolutionize the RV industry if the hitch system was integrated into all fifth wheel and gooseneck trailers. That led to another 15 minutes of conversation. Just think about it, not only would trailers become tremendously safer to control and stop, the nose area of these RVs could gain up to one foot of headroom and overall height be reduced three feet. The trailer’s ground clearance could be reduced, improving controllability and safety. There would be no more concern about keeping good height above the truck bed-rails. Trailers could be towed level instead of nose high creating less drag and improving fuel mileage and weight distribution on the trailer axles. The distance of the kingpin location could be moved back resulting in improved structural strength and better control. The trailer’s GVWR could also be increased while tow vehicles would not necessitate such a change, which is especially important for toy hauler and full-timer owners. There are far more benefits to using or integrating the Automated Safety Hitch System than the one disadvantage noted on RV forums, which is reduced weight over the truck’s rear axle. Jamieson noted that that is why he recommends owners use a tow vehicle with four wheel drive for those situations that require additional traction. On the other hand, the truck bed has been freed up to carry cargo that was once limited. Hmm… You just may see an ATV and a couple of Segways in the back of my truck someday, as well as a bigger fuel tank. What would you add to your truck? 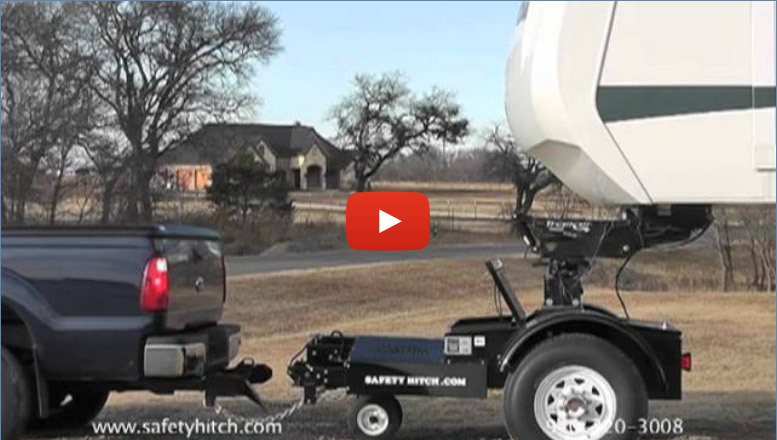 To learn more and watch numerous videos of the Automated Safety Hitch System in action, visit Jamieson’s website at http://automatedsafetyhitch.com or call him at 1 (866) 465-1454. Towing a trailer that weighs twice as much as the tow vehicle requires proper equipment to do it safely. You are already at a disadvantage because the brakes on the trailer are electric drum brakes rather than disc brakes. In addition to brakes on the trailer and tow vehicle you need a properly sized & equipped truck, and the proper hitch-work. I recently met someone as concerned about trailer towing safety as I am. He was not only concerned about it, he actually did something about it. His name is Joe Jamieson. Joe is a Federal Aviation Agency certified Airframe and Powerplant Mechanic, a former Air Force Pilot, a Federal Aviation Agency certified Air Transport Pilot and an Inventor and Industrialist, who focuses his efforts on enhancing the safety of transportation systems. From designing and manufacturing autopilot control systems for jet- powered helicopters, his inventions are aimed at keeping people safer when operating aircraft, vehicles and equipment. Fortunately for RV owners his latest brainchild is the Automated Safety Hitch™ System for trailers. Automated Safety Hitch was recently reviewed by Mr. Truck.